Hopefully you’ve already read about how to choose the best bike lock. And you’ve got a good idea what level of security you need, the type of lock that’s right for you and the differences between the major brands. OK, but they’ve forgotten to lock the frame to the rack! You also need to know how to secure your bike properly. Because whichever lock you choose, if you don’t use it properly, your bike will be stolen. Why several different ways? 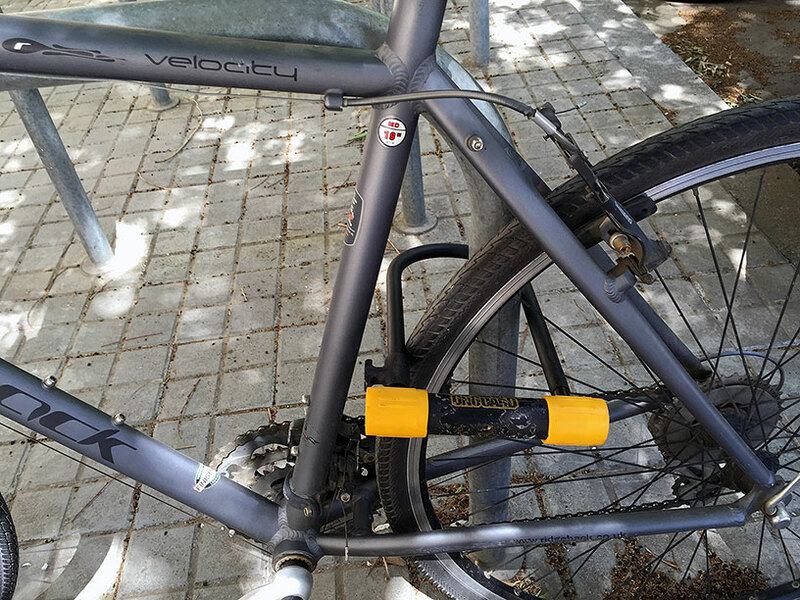 Because locking your bike isn’t just about security, it’s got to be convenient as well. And by the end of the article you’ll be able to make an educated choice on which one provides the best balance of security and convenience for your circumstances. If you’ve already got a lock I’ll show you how to get the best out of it. If you haven’t got a bike lock yet, even better. Because thinking about how you’ll secure your bike can help you choose the right lock. Different techniques favor different locks. So make sure you’re familiar with the options below and try to think which one will be best for you at home and in your neighborhood before you buy a lock. The guide is divided into three parts based on the three places where you’ll likely be locking your bike: in the street, at home and at work or college. Where should I lock my bike in the street? Try to choose a busy location with lots of people walking past. If it’s an area well covered by CCTV, even better. Other people and CCTV make thieves nervous. They’d much prefer to be hidden away while they “work”. Firstly, there’s bound to be badly locked bikes more tempting to a thief than your well-locked bike. Secondly, lots of bikes crammed together give a thief less room to maneuver and use their tools effectively. And thirdly, the comings and goings of other cyclists may disturb them and if anyone is going to challenge a bike thief, (and lets face it most people just walk on by), its going to be other cyclists. The middle of a busy bike rack is the place to be! A bike is only as secure as the object it is locked to. So make sure you always choose a fixed, immovable object that’s not easily broken. These “Sheffield” stands are cemented into the ground and super secure! Check the bike can’t be lifted over the top of whatever you’ve attached it to. Or that the object can’t be easily unscrewed or dismantled. Avoid trees, aluminium or wooden posts, sign posts, scaffolding and chain link fences. If you choose metal railings, try to get the lock around as many railings as possible. But ideally the immovable object would be a specially designed bike rack that’s cemented into the ground. If you’re going to the cinema, the leisure center or anywhere else where you might be away from your bike for a significant time, consider locking your bike a couple of streets away. Why? If a thief sees you locking your bike and then going in to any of these places they’ll know they’ve got a fair bit of time to work on your bike. If you know an area is dangerous, avoid it. Or if you can’t avoid it, take an extra lock. And don’t leave your bike for too long! How should I lock my bike in the street? Try to keep the lock away from the ground. If it’s on the ground, a thief can use a hammer to smash the lock against the hard floor and this will break cheaper models. Also, the closer it is to the ground, the easier it is to use the floor for added leverage in a bolt cutter attack like this. Keep your lock away from the ground. But off the top tube. However, also avoid the top tube. 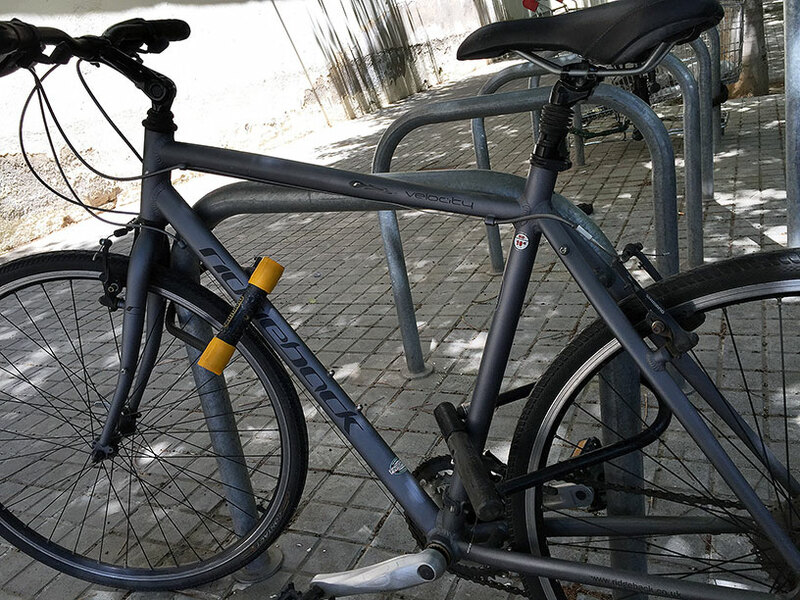 If the lock is around the top tube of the bike, a thief can use the frame itself to try to break the lock by lifting and twisting the whole bike. So, ideally the lock should go high up around the down tube or the seat tube. Try to make the lock as difficult to access as possible. If you can position it so the key hole is facing downwards even better. This will make it more difficult for a thief to attack the lock or tamper with the locking mechanism. If you’re using a U-lock, try to fill as much of the space within the U with the bike and the thing it’s attached to. The most common way that the better U-locks are broken is with a bottle jack which is inserted into the space within the U. If there’s no spare room inside the U, a thief can’t use this method. 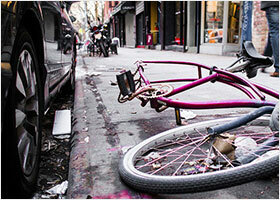 Making use of those general tips, here are four popular ways to lock your bike on the street. Which one suits you best will depend on how expensive your bike is and which locks you have. 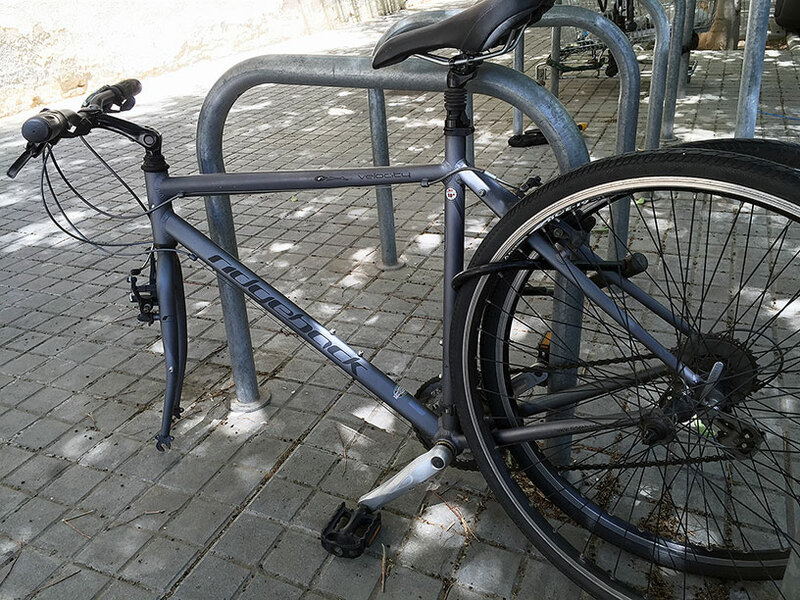 The most secure way to lock your bike is with two locks. And ideally to a bike rack that’s cemented into the ground. The first lock should go around the back wheel, the frame and the bike rack. The second should go around the front wheel, the frame and preferably the bike rack as well. I like to combine a chain lock with a U-lock. I leave my bike out in the street all night. And as I secure it in the same place every night, I leave a heavy chain lock permanently attached to the bike rack so I don’t have to carry it around. I depend solely on the U-lock in the day. But if I know I’m going somewhere risky or a place where it might be left over night, I can always take the chain lock with me. However, it’s worth mentioning that if you choose to leave a heavy lock in a public place, you run the risk of an aspiring thief using it to practice his art. Or even worse, if a thief’s clocked your bike, he might sabotage the big lock while you’re away, forcing you to use only the other, smaller lock when you return. Whereupon he will pounce on your compromised security. So be careful! I should also add that in the photo above, the chain is actually far too loose and could be maneuvered close to the ground where it would be vulnerable to bolt cutters. Another very popular technique is to use one decent lock and a cable. Attach the U-lock or chain around the rear wheel, the frame and the bike rack as above. Then push one end of the cable through the front wheel, pass one loop through the other loop and secure the first loop to the main lock. The advantage of this method is that the cable is very light. So you’re saving a huge amount of weight over using two proper locks. Of course, the problem with this method is that the cable is the only thing securing the front wheel. And as I’ve mentioned before, since all cables can be snipped through in next to no time, they offer zero practical security. You might as well tie it up with string! On top of that, threading the cable through the bike in a tight, busy spot can be a right hassle. And although they’re light, they’re quite bulky and not so easy to carry around. However, many people think the visual, psychological deterrent of the cable is enough. And if your bike has cheap wheels that don’t use quick release skewers, then this might be the case. I don’t like this method though and I definitely don’t recommend it for quick release wheels. Attach the U or chain lock around the rear wheel, the frame and the bike rack as above. But also around the front wheel which you’ve removed from the front forks. 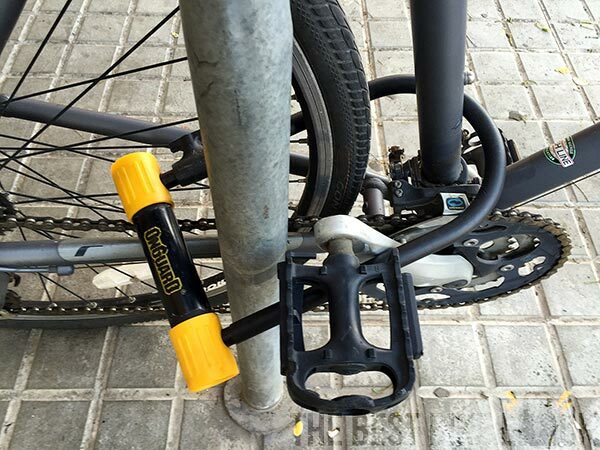 This certainly ensures that both wheels and the frame are secured with one good lock. And if you’re using a U-lock it’s going to be full of more stuff and therefore less susceptible to a leverage or bottle jack attack. However, bear in mind that this method requires a standard or larger sized U-lock. And using a chain instead would be very fiddly. To use this method you’ll also need quick release wheels, which means you’ll have to do it everywhere you go to prevent the wheel being stolen. Both of the last two techniques attempt to resolve the problem of how to secure the front wheel when you only have one lock. This is especially important if you have quick release wheels which allow you (and anyone who wants to steal them!) to remove your wheels very quickly without the use of tools. For me, quick release wheels (and saddles) are more trouble than they’re worth. How often do you need to remove your wheels? Better to replace the quick release mechanism with normal nuts or secure skewers. This makes your wheels much harder to steal and in some cases negates the need for a second lock. Sheldon Brown, the renowned bicycle expert, advocated securing just the rear wheel to the bike rack, using a U-lock somewhere within the rear triangle of the frame. 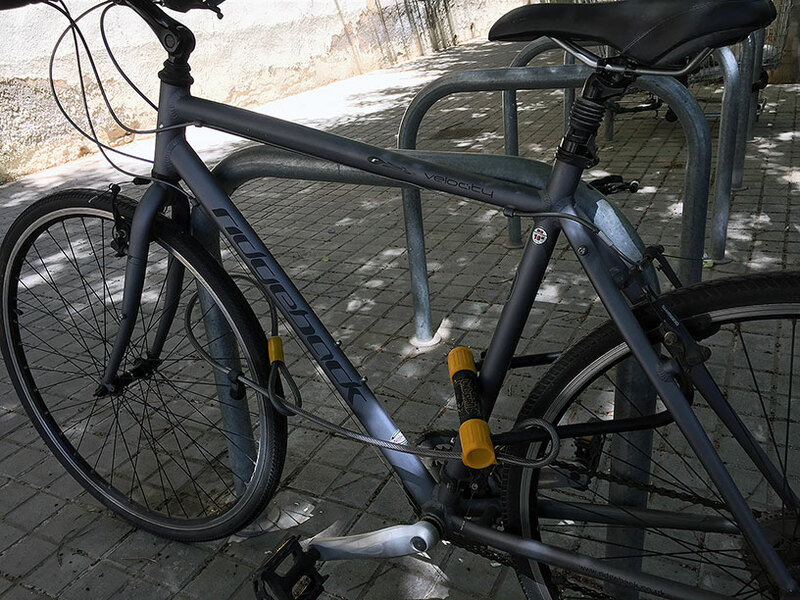 He maintained that by using this method, you don’t need to secure the frame to the bike rack as well because the wheel cannot be pulled through the rear triangle. One of the advantages of this method is that because you’re only securing the wheel, you can usually get away with a smaller, lighter u-lock. However, I’m not sure about this technique, especially for more expensive bikes. Apart from the fact that with some effort, a dedicated thief could saw through the rear wheel to remove the lock, I can also imagine an opportunist thief not realising the bike was properly secured and causing significant damage to your bike while they tried to remove it. However, if for whatever reason you can’t maneuver your bike into a position where you can lock the frame as well, I think this technique is OK for short periods. It’s worth remembering that while street theft gets all the attention, over 50% of stolen bikes are taken from the owner’s home. That means from the front or back garden, from a shed or garage on the property, or from inside the house or flat itself. What can you do to prevent this? Well, although bike security at home is often more challenging than bike security in the street, there’s still plenty you can do to protect your ride. Inside your house or flat is undoubtedly the safest place to keep your bike. However many people are either unable or unwilling to share their living space with bicycles. Maybe they (or more often other family members!) don’t like the idea of big, wet, dirty machines cluttering up their home. Maybe they don’t like the hassle of dragging a bike into the building. Or maybe there just isn’t enough space. If space is the issue, there are plenty of companies now offering storage solutions for bikes inside the home. Such contraptions vary hugely in design and price. But at the end of the day they all amount to something you attach to the wall or ceiling to hang your bike from. They look great in the adverts but the stylish bikes in the adverts are never covered in 3 months of London street grime. However, if you can fit your bike in your house and there are no problems with it being there, this is definitely the safest place to keep it. If you live in a flat with shared communal space inside the building, it can be tempting to leave your bike there (often in the hallway, just inside the front door). But in reality, this is a very unsafe place to store anything. Usually there’s nothing to secure your bike to and because it’s not your space, little opportunity to install something. So in the end, your unprotected bike sits in the hallway waiting for someone to forget to close or lock the door and someone else to stroll off with it. Because one things for sure: no one else in the building is thinking about keeping your bike safe. One DIY solution is to fill a large bucket with cement and stick a ground anchor or an old u-lock in the wet cement to set. Voila, you have a pretty heavy anchor you can leave in the hallway to secure your bike to. I have a friend who added some plastic flowers to the top of the bucket to make it look less intrusive to the other residents of the building! Now admittedly this will only slow down, rather than stop a committed thief. But it will foil many opportunists. If you’re lucky, maybe you have a garage or a shed at home. And if you can’t keep your bike inside your house, then this is the next best alternative. Usually, garages are more secure than sheds. However, you should never, ever leave your bike unlocked in either one. Remember, over 50% of stolen bikes are taken from the owners home, so no matter how safe it feels, this is where you bike is most at risk. Garages have the advantage of concrete floors and brick walls. This makes it relatively easy to install a ground anchor which you can use with a heavy chain to secure your bike. Garages are not as secure as they look! Just like locks, anchors vary widely in levels of security and price. 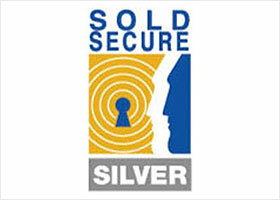 Luckily they’re also rated by Sold Secure and ART, so it’s easy to find a good one. Ground anchors can usually be attached to the floor of a garage and are best used with chain locks. Since you don’t need to worry about carrying these chains around, get the thickest chain you can afford. But make sure the chain is not so thick it won’t fit through the shackle of whichever anchor you choose. Wooden sheds don’t usually have concrete floors which makes installing a normal ground anchor difficult. You could rip up a section of the floor, dig a hole into the earth below, fill it with concrete and add a anchor such as the Oxford Terra Force to set in the wet concrete. However, this is a lot of work and may be completely unpractical. Luckily, Pragmasis now offer a “shed shackle” specifically designed to give you something secure to lock your bike to in a wooden or metal shed or bike store. I think these are great. They’re relatively cheap, practical and easy to install. Whats more, if you couple one with a good chain, a thief would have to virtually demolish your shed to steal your bike. 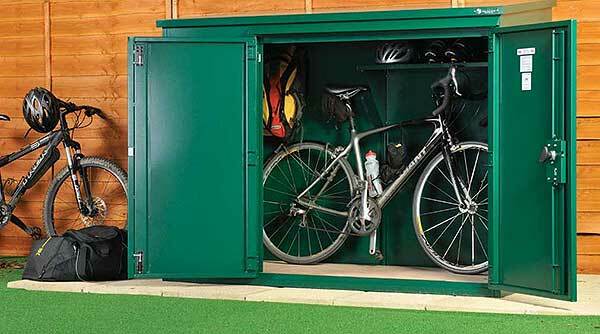 If you don’t have a garage or a shed but do have space in your garden or yard, consider buying a specially designed bike storage unit. The best (and most expensive) are made by Asgard. Asgard bike storage. Very secure. Very expensive. If there’s no space for a storage unit, then you’ll have to keep your bike in the open air. In this case, if you’re able to install a ground anchor somewhere in your garden, then do it. Maybe there’s a patch of concrete to attach an anchor to. Or you could dig a hole in the earth, fill it with wet concrete and add a Oxford Terra Force to set firm. Or you could use the bucket trick I suggest for communal spaces. Whatever you do, don’t leave your bike unsecured in your garden no matter how private or out of the way it might seem. Many workplaces now offer private spaces where you can leave your bike if you’re commuting. This is great news! Obviously the security levels in these places will vary. But the most important thing to remember is that if anyone other than you has access to the space, you should lock your bike as if you were locking it on the street. You still need to lock your bike in here! It doesn’t matter how small your office is or how secure the space seems. If other people have access to it, there’s a very real chance of it being compromised at some point. While I was living in London I lost count of how many times bikes were stolen from office lock ups than seemed impregnable. Buying the best bike lock is only the first step. You need to know how to lock your bike properly too. And you need to lock your bike properly everywhere: in the street, at home and at work or college. In the street, locking your bike to a strong, immovable object in a busy area with lots of other bikes and CCTV cameras is a great start. But make sure you lock it in the right way too: locking the frame and the wheels, keeping the lock off the ground, and making sure you fill as much of the space inside a U-lock as you can. If possible, use the same techniques you use in the street to lock your bike at home or at work. It doesn’t matter how secure your home or work environments seem, never leave your bike unlocked. At home, often there is nothing really secure to lock your bike to. If this is the case, it is certainly worth investing in ground or a shed anchor. Of course none of these precautions will protect your bike if you use them with poor quality locks. In the street you’ll need a good U-lock or a portable chain lock. At home you should use the thickest, strongest chain you can afford. If you’re not sure which is best for you, check out my simple guide to choosing the right bike lock. Hi Carl, great site! Thank you for all you do on our behalf. I live in Dallas, Texas, a fairly big city. I’m receiving a much-awaited a Trek Crosscheck ALR5, aluminium-framed gravel bike today; and I want to give it the best security possible. I would have a hard time replacing it. On occasion will be riding it to the gym and locking it to a standard steel bike rack which is firmly anchored to the concrete slab, outside their main window. Lock/chain weight is not so much a consideration. I’ve had the bike shop install HexLox and their through-axles on the wheels, saddle, saddle post, and handlebars. 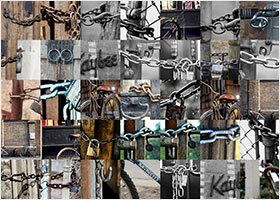 For the highest security should I still use both a top notch D-lock and a chain as you suggest somewhere in the text above, in addition to the HexLox; or do the HexLox replace my need for a chain? 1.) There are occasions when I might be riding around parts of town with telephone poles etc. and no bike racks. 2.) I live in a townhome with a fenced-in back yard accessible from the alley. Low to no monitoring or traffic. Maybe I should have a ground anchor and chain to give me the option to lock it up overnight, outdoors. This all seems to suggest my having a chain that is secure enough for optional night-time lockup but still okay to carry with me when I go to non-rack areas of town. If I’m right, which one should I look at ~ the K.NY Noose? I’d still be well-advised to get a D-lock for best security during daytime? Would that mean carrying around something like a K.NY Noose and a K.Fahgeddaboudit Mini in my messenger bag? I don’t mind the workout, but is there an equally-secure way that happens to be lighter? Thanks, again! Well, first of all I think you made a great move with the Hexlox. I’m a huge fan. And they make the next step much easier. For a $2K bike you should definitely make sure you’re covered by insurance. 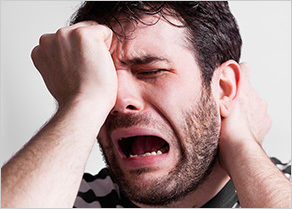 Whether that’s specialist insurance or part of your home insurance will depend on your circumstances. The insurance may specify where you can and can’t leave your bike as well. I’m not too keen on you leaving your bike outdoors in an accessible yard overnight. But if you have to, then definitely a ground anchor and thick chain are essential. It’s a tricky one. Because the NY Noose was what I was going to suggest as well. It’s really secure. And it’s just about portable too. But for such an expensive bike in such a sketchy situation, I feel like maybe a un-croppable chain might be better. So at least the Kryptonite NY Legend Chain. Or even a 16 mm chain. But they’re far too heavy for when your riding around town. If you could create a set up in your back yard where you could use a u-lock, then a combination of the NY Noose and a Fahgettaboudit would work really well. As the Fahgettaboudit would act as the un-croppable lock. So I’m talking about using the u-lock and the chain in your yard. You could also look at an alarm! Unless you were going somewhere really risky I think taking one or the other of them would be fine. Both together would be incredibly heavy. If the Fahgettaboudit is too small to use in your yard then the Kryptonite NY Standard or even the Abus Granit 540 could work as well. 1.) Any thoughts on good indoor bike-hanging gear? 2.) For “rolling risk,” (during daytime trips in highly-public metro areas, both with brief bike-absence and with multi-hour absence) could I reconfirm your best recommendations? 3.) 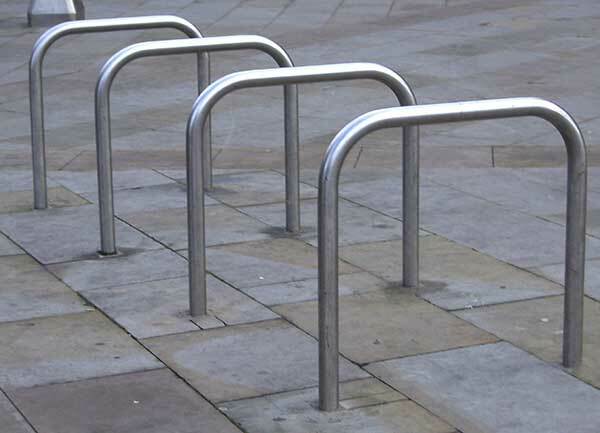 Got a huge kick on reading your blog about personal experiences in keeping bikes outside. When you said that componentry was vanishing (at one stage) it brought to mind my disc brakes. To prevent someone from nicking them while I’m indoors somewhere for an extended period should I be using more HexLox (not sure if they come that small!) or Ottolok? 4.) Helmets. Ai-ai-ai. Secure with what? Fancy accessories like Spurcycle bell? 2) The NY Noose is a good choice. 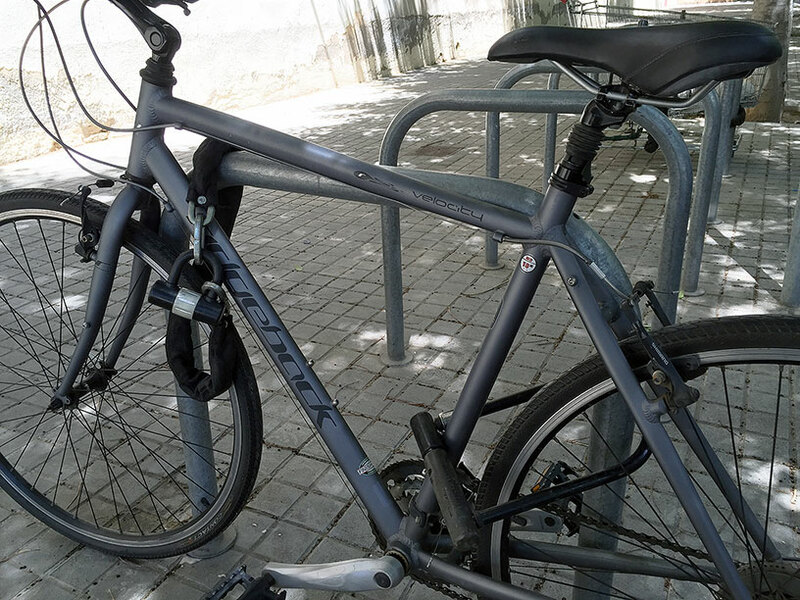 When you lock your bike, I’d recommend you wrap it tightly around the top tube so a thief can’t manouvere it close to the floor where they’d be able to use the ground as leverage with bolt cutters. 4) Helemts, I’d say take with you. Spurcycle Bell are attached with a 2.5 mm hex key so Hexlox won’t work. I’ve had loads of cheap bells stolen in the past so you definitely need to address this! What I do now is fill the screw head or hex hole with glue or filler. Not nice but seems to work. BTW, cost is a secondary consideration: if my unique needs suggest two – or even three – strategies and sets of locks, so be it. Cycling is one area where I’m hesitant to cut corners whenever there’s some benefit. Call it “cheap therapy”! If you want to add another lock then the Abus Granit X-Plus 54 Mini is a a great choice and won’t add to the weight too much. The good thing about 2 locks is that you can pick and choose depending on where you’re going. Take one, the other or both depending on how sketchy the area is, how long you’re likely to leave your bike etc. IiGr mini is very small so it’s no good if you’ll sometimes be in places where there aren’t racks. The Litelok could work if weight is a big issue for you. But it’s definitely not as secure as the NY Noose. Yep sure they’ll give you more locking options. The Abus uGrip Plus 501 is Sold Secure Gold as well, but isn’t as secure as the 540. And don’t forget combining the noose and the u-lock will give even greater security for particularly sketchy areas / longer stays! Ooops, please throw the Abus uGrip Plus 501 in that last list of possible alternates to the Abus granit X Plus 54 Mini. He also mentions they may be able to fabricate it. Hmmm, maybe an additional security product from them?! • bought and installed HexLox on everything, including saddle, seat post, head, handlebars, through-axles, adjustable drop-outs (unique aspect of Trek Checkpoint), water bottle brackets, etc. I found a Bell Catalyst 550 at a local discount store that I like for a budget lock. It’s a double-bit lock, and the “U” is rectangular, which means that a thief would have to cut both legs of the “U” to get the bike instead of cutting one leg of the “U” and rotating the lock cylinder in order to release the lock cylinder from the”U”. Bell claims that the lock has been tested by a standards organization, but I did not see who tested the lock on their web page. I doubt the Bell lockhas been tested by anyone reputable Alain. Make sure you regularly clean and lubricate both the mechanism and the ends of the shackle as these locks have a bad reputation for seizing up. Trade-offs abound! For homeowners, check insurance carefully; anything inside a locked house or garage may be covered, or added for a nominal rider fee, or else see if a specific sub-policy can be added just for the bike. Once outside, it is a crapshoot, and no regular insurance will cover. If you own a large SUV etc where a bike can fit into it, car insurance may be cheaper coverage than other options. As to locking, once thieves target your bike, it becomes an elapsed time event; when, for how long, do you leave it unattended, how predictably. Locking it within a carport or area not directly in sight from passing cars or others may make it unknown to thieves, unless they watch you one day going in or out. Disguised bikes aren’t necessarily less attractive, either, as they can easily see through gunk and old paint jobs. A paradox for bike lovers may be to ride the worst bike you can tolerate for the job – a true junker if commuting is short may be better than a sleek fixie. Committed distance/all season commuters should demand allowance for the bike in your office/workspace, but still lock it there as well! Thanks! Tha looks like a really secure combination. Have you heard anything about bike lockers? My university has individual bike lockers that can be rented like these (https://cyclesafe.com/product-category/bike-lockers/), but I haven’t been able to find anything about the security of them, other than claims from the companies that make them. Thanks Erin, they do look really secure! Lockers like these tend to be sold to other commercial companies and local authorites rather than individuals though. I echo everyone else’s comments about your amazing site and the amount of methodical hard work you’ve put into it -thank you! Until last week, I was relying on a soldsecure gold Abus 6500 bordo lock for my pride-and-joy Brompton folding bike on its own. I’ve now got a Kryptonite M18WL on order for approval at my local bike shop and am planning to use that along with the Abus bordo on those very rare occasions when I have to leave the Brompton outside somewhere. So sorry about the late reply Helen. I haven’t got any personal experience of locking Bromptons. But I suppose one of the attractions of a Brompton is that you can take it most places with you, so reducing the need to lock it up as often! Obviously there will be occasions that you’ll need to lock it though and your suggestion sound very secure to me. The Kryptonite M18WL is a very tough lock! Just make sure you don’t leave any space for a hydraulic jack within the D and you should be OK! Thanks for ALL the very valuable information for it has been a Great Help, and Very Interesting as well!!! I use locks only for the minutes it takes to renew my library book or order a coffee. When I ride to work I take my bike inside and park it in my office. In the past I parked in a storage room. At home the bike is in the house with me, sometimes in the garage, most of the time in the living room. I don’t rely on any locks for more than a moment or two b/c of rechargeable grinders. If I ever move some place where my bikes can’t be inside I’ll probably only ride my $40 gravel bike.